The wizard has big summer plans: To garden, fish, and nap. The only thing better would be if he had someone nice to share the days with. But the only people who show up want him to rescue yet another princess, lift the usual vile curse, confront a fearsome ghost, deal with a pack of magical hooligans, harvest a crop of golden cucumbers, and on and on. . . .
With everything he has to do, it's no wonder the wizard is all by himself! Who'd want to help him do all of that? Readers will enjoy four short stories that weave a delightful tale of a wizard that just wants a break. Throughout the tales, readers can expect to encounter familiar characters and stories, but don't be fooled. There are definitely twists along the way. 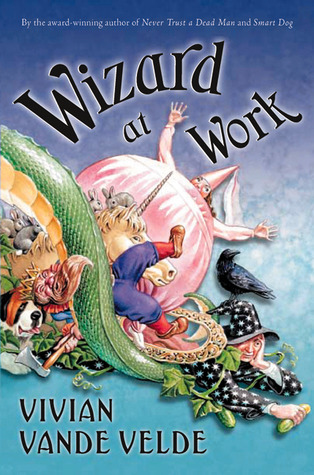 Wizard at Work is a quick read and suitable for readers in grades 1-3. Simple ink drawings correspond with the stories throughout the book to help younger readers visualize what is happening. I think this book would make a great read aloud in class or a bed time story. Each chapter is a new story, so they could easily be read one at a time.